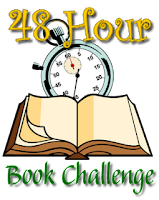 At the end of May, 2006 I signed up for the first 48-Hour Book Challenge, the inspiration of Pam Coughlin at MotherReader. I did a magical realism tour for my first book challenge with seven stops. I took part in 2007 and 2008 and again in 2014 and 2015. 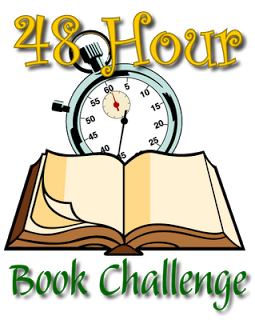 The 48-Hour Book Challenge was a reading and blogging binge. You picked 48-hours over a 3-day weekend Pam selected, usually at the beginning of June, and during that period read as much as you could of whatever you wanted and blogged about the books you completed. Because that's what litbloggers do. There was a list of participating bloggers at Pam's site so you knew which of your friends were reading and blogging with you. There were prizes. No 48-Hour Book Challenge this year. Pam/MotherReader is calling it a day, figuring ten years is a good wrap-up point. There may be some interest in bringing it back next year, but for now the Challenge is a happy memory. Some litbloggers who were around back then refer to the mid '00s as the Golden Age of Blogging. As I'm sure I've said before, I think of that time as a wild west/frontier experience. There were no instructions on how to blog, no talk of writers building platform, no articles on why writers need blogs or how they can get by with a blog instead of a website. Internet book bullying was still in the future. No one had come up with ways to use blogs to market books. No one had started companies organizing blog tours for writers. Magazines weren't sponsoring blogs. Because we sponsored ourselves! Yeah! Ya just went out and blogged in those days! Sink or swim. Blog free or die hard. Blogging was truly social media then, at least in the childlit world, because bloggers interacted, commenting on each others' work and posting links to one another. You were part of a community. Kind of an underground community. Which was cool. The 48-Hour Book Challenge was an on-line ball for the childlit blogging world. Well, nostalgia isn't healthy. So let's hitch up our big blogger pants, toss back a little of whatever we like to toss back when we're paying tribute, and get back to whatever bloggy things we do these days. And Twitter. I'm going over to Twitter when I'm done here. We had some good times, Book Challenge. Have fun in retirement. I had to take a lengthy break during a high intensity eldercare period. I think family cut into the book challenge more than work did. Interesting. I enjoyed it as well and am definitely missing it this year. So many fun memories. Since my birthday is in February, I'm giving myself a half-birthday read-athon weekend in August to fill the void. Now I'm thinking of all kinds of special events when I could be doing a personal read-a-thon.